Play enough John Lennon-composed songs -- within The Beatles or without them -- and sooner or later you will run into an augmented chord. It's unfortunate, too, because augmented chords are knotty messes for guitarists. There's never a clean way to voice them and get a "full" sound, mostly because augmented chords are simple three-note constructions. Give me a diminished or a diminished-seventh chord any day over an augmented chord. But back to John Lennon. 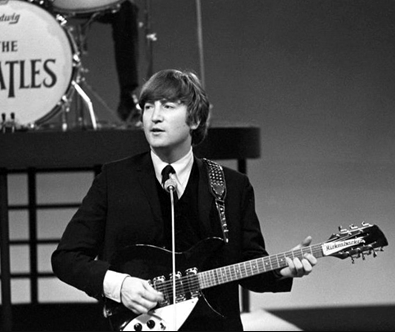 Right at the start of their recording career, The Beatles released "Ask Me Why" as the b-side to their second single, "Please Please Me", and there it is: a Lennon augmented chord. You can hear it in the transition to the bridge, after the words "you're the only love that I've ever had" and before "I can't believe," as the progression moves from the I chord to the I+ chord. You'll find it again in songs like "It's Only Love", where he uses a V-to-V+ transition at the end each phrase of the verses: "my oh my," "butterflies," "every night," and "very bright." But in particular, John seemed to like to use the G augmented chord. He used it very early on, in The Beatles' hit single "From Me to You" -- listen closely as they sing "and keep you satis-fied, wooo!" and you'll hear that G-to-G-augmented movement. You can hear that chord again in "Being For the Benefit of Mr. Kite" during the first phrase of the verses: "for the benefit of Mr. Kite", "the Hendersons will all be there," etc. In "Real Love", John found a way to use the G augmented chord within the key of E major, which is no easy task. Beginning with a simple progression of I-iii-vi (the same progression he uses to open "Across the Universe", "A Day in the Life", and "Anytime at All" to name a few), he turns to the augmented chord on the lyric "lost like some forgotten dream" -- it's a very different effect in this context than when he uses the exact same chord in "From Me to You", "Mr. Kite", or elsewhere. But getting back to The Beatles' canon proper, there are two songs in which John uses this same augmented chord in the same key as "Real Love", in almost exactly the same way. The bass line simply moves chromatically down the scale -- 1-7-b7-6 -- but the chords that John uses to fill in the space around that descending line are very interesting choices. While this chord progression begins at a different starting point than "It Won't Be Long" (the iii chord as opposed to the tonic chord), the movements are incredibly similar and end up arriving at the same destination. A great article, I'm surprised there aren't any comments. Thank you! I've been noticing John's usage of this chord for a while.